Objective: Learn about the connection between climate change, the melting of ice and the ocean's ability to store heat, and the effects on ocean circulation and ocean volume, and therefore sea level. Science operates to increase our knowledge of the physical universe by addressing well-formulated questions and hypotheses, with valid experiments, which then produce verifiable data to support its conclusions, which add to our understanding of the earth. Graph #1 - analyze the graph above, produced by research at the Goddard Institute for Space Studies of NASA: What does it show? Write the meaning of the above graph and your conclusion from these data in your expedition worksheet. What does it show? Write the meaning of the above graph and your conclusion from these data in your expedition worksheet. Analyze the animation in the graph above, produced by research at the Goddard Institute for Space Studies of NASA: What does it show? Write the meaning of the above graph and your conclusion from these data in your expedition worksheet. 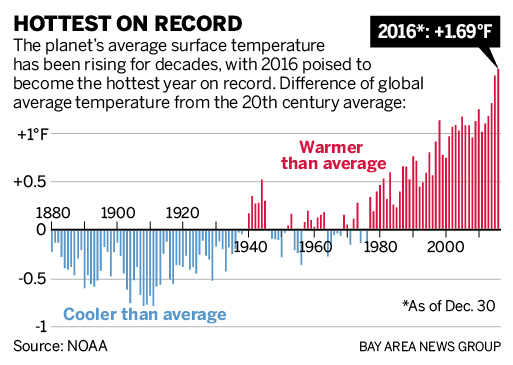 Graph #4 - analyze the graph above, based on research at the National Oceanic and Atmospheric Administration (NOAA) and published in the San Jose Mercury News(and it is not "fake news"): What does it show? Write the meaning of the above graph and your conclusion from these data in your expedition worksheet. 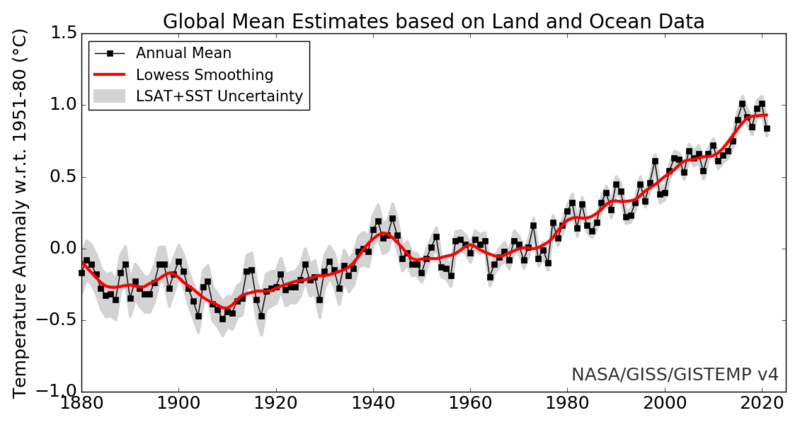 Graph #5 - In this animation, the Earth rides the "Global Temperature Anomaly," a rollercoaster that shows the difference from historic average temperature since the last ice age. Not only is the current “hill” on the roller coaster as high or higher than anything our species has experienced since we first settled down from a hunter-gatherer lifestyle, but it’s also the steepest climb. Compared to the past 11,000 years, the current track is nearly vertical. NOAA Climate.gov animation and art work by Carlyn Iverson and Emily Greenhalgh. Roller coaster is based on paleoclimate data from Marcott et al, 2013, A Reconstruction of Regional and Global Temperature for the Past 11,300 Years. Science, 339(6124), 1198–1201. http://doi.org/10.1126/science.1228026. Again, analyze the video above, based on research at the National Oceanic and Atmospheric Administration (NOAA): What does it show? Write the meaning of the above graph and your conclusion from these data in your expedition worksheet. Graph #6 - Last, analyze the video above, based on research at the National Aeronautics and Space Administration (NASA): What does it show? Write the meaning of the above graph and your conclusion from these data in your expedition worksheet.